Richard Newton was born in 1777. He became a caricaturist in the style of Thomas Rowlandson, William Hogarth, Isaac Cruikshank and James Gillray. His first known print shows Newton painting George III. Newton produced a series of prints showing the poor taste of the king. 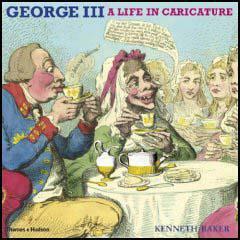 In his book, George III: A Life in Caricature, Kenneth Baker argues that: "Not a scholar, George's taste was more that of a well-read country squire. He did not care much for Shakespeare, telling Fanny Burney that it was sad stuff". Newton was a supporter of Tom Paine and made several visits to Newgate Prison to see his own publisher, William Holland, who was serving a prison sentence for publishing pamphlets such as Rights of Man. 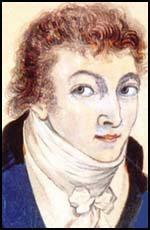 Richard Newton died of jail fever aged 21 in 1798. 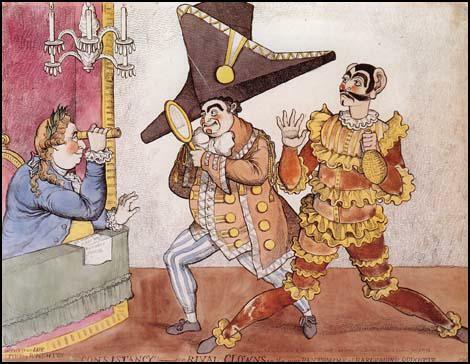 Richard Newton's print shows King George watching two clowns (1798).